CAMERA QUARK turns your CANON style SLR lens into a Hydrogen Alpha Solar Telescope! 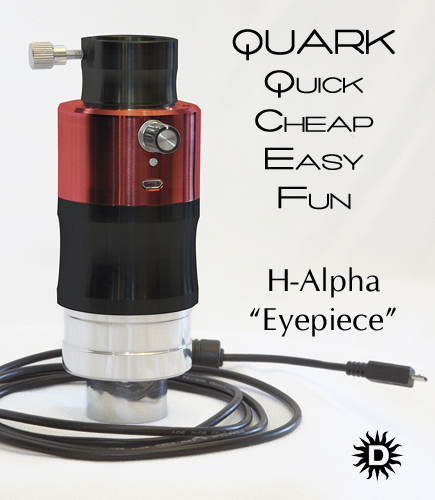 QUARK Camera Adapter - turns your CANON style SLR lens into a Hydrogen Alpha Solar Telescope! Conjoins your QUARK filter with a Canon style SLR lens for Hydrogen Alpha Solar viewing with most standard lenses. Quark owners can enjoy the full range of focal lengths and features available with quality Canon lenses, including zoom features. QUARK Camera Adapter - turns your NIKON style SLR lens into a Hydrogen Alpha Solar Telescope! Conjoins your QUARK filter with a Nikon style SLR lens for Hydrogen Alpha Solar viewing with most standard lenses. Daystar Instruments QUARK MgI b2 line "Eyepiece"
By popular demand, we are introducing a Magnesium I b2 line version of the Quark, for use in refractors F/4-F/9. Magnesium shows high contrast between granulation and spicule boundary in addition to plague emission.